BOSTON Technology has introduced two new single-mode fibre optic (FO) converters -- the Model 376 permits 10Base-T to single-mode FO conversion, while the Model 377 converts 100Base-T to single-mode FO. These fibre optic transceivers permit communication with remote ethernet-based robotic systems or PLCs. The addition of a pair of Model 376s allows a LAN to be extended to a distance of 38km. The 376 provides the operating solution at 1550Nm, one of the wavelengths required for WDMs. The Model 376, in combination with a two channel WDM, allows the mixing of multiple LAN traffic, or the combination of LAN and video, CATV, T1/E1 or any other data source that can be provided at 1310Nm. These two wavelengths, are utilised by most low cost WDMs, which expand the utilisation/bandwidth of a single fibre pair. LANs can be spread to other buildings and facilities. When this is attempted with wires there is usually concern with electrical interference. These concerns don't exist when the link is glass fibre - being totally impervious to lightning and surges. The Model 376 provides total electrical isolation. 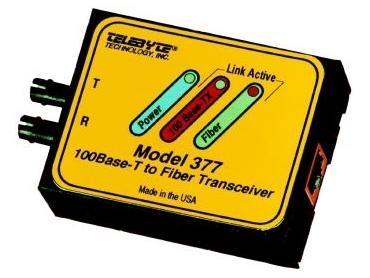 The 377 series of media converters are single-mode 100Base-T transceivers. These devices allow maximum utilisation of the 100 MHz bandwidth. There is virtually no retransmission for lost or errored packets. The signalling utilises full duplex communication to eliminate the response problem in collision sensing. This is a major innovation, since the response time over a long fibre optic network may exceed those normally allowed in half duplex communications. The Model 377SC offers 100Base-T compatibility and 100Mbps full duplex on single-mode fibre at 1310Nm over 33km using SC connectors. The Model 377ST uses ST connectors. An enhanced Model 377ST-1 can handle a worst-case loss budget of 32dB, therefore with a 377 at each node, a link can be extended up to 90km. Boston Technology 02 9955 4765.